Success in business depends on how do you use the resources available to you software SAP ABAP is on of the most useful software available to get best results.Even if the management-driven success factors are in place, ABC projects may fail due to software driven factors.By implementing ABC, you can overcome software-related problems because of the R/3’s high degree of integration and scalability.The key factors for a successful ABC implementation fall into two categories: management-driven and software-driven.The management-driven issues, shown in the top of the slide, must be addressed first. This requires that management understands indirect cost utilization and establishes and enforces policies based on that knowledge.As we move down the slide, the issues become more and more software-driven. For example, if there is no need for double -maintenance of parallel Cost Accounting Systems, you can eliminate redundant data input and reduce the potential for database inconsistency. SAP's comprehensive approach to Activity Based Costing comprises the functionality of the CO components CO-OM-ABC, CO-PC and CO-PA.In CO-OM-ABC processes can be defined to pull overhead resources from different parts in the organization. Using appropriate drivers the corresponding costs are allocated to products (CO-PC) or directly to profitability segments (CO-PA). Two different ABC approaches are supported by the R/3-System: the Push-Approach and the Pull- Approach.The Push Approach is the traditional ABC approach, and is used when costs must be distributed appropriately based on tracing factors representing the resource and cost drivers. Activity quantity flows are of no importance in this approach.The primary difference between quantity consumption (Pull) methods and pure cost distribution (Push) is that the Pull Approach is based on allocation of activity and business process quantities,which are then evaluated with prices in a second step. Allocation takes place using a cost element specific to an activity type or a business process. The ability to create multiple quantity and cost flows opens up a wide range of possibilities for using Activity-Based Costing (ABC) techniques in the overall framework of Activity-Based Management (ABM). The Pull Approach also allows you to answer questions like “What is the cost of idle capacity?”,which can only be answered when the utilized capacity is known and compared with the total available capacity.As companies mature in their use of ABC, they will be likely to move toward the Pull Approach, because it provides a more powerful tool to manage resources and capacities. Although the Push Approach is easy and straightforward to implement, it has significant drawbacks compared to the Pull Approach when it comes to the information provided by the ABC system in an Activity-Based Management context.Due to the lack of a quantity flow model a backflushing of sales quantities (CO-PA) down to the resource level on cost centers is not possible when using the Composite Approach. However, this functionality is essential to identify idle capacities of the resources during your flexible budgeting phase, as well as to look for other usage of these resources. To optimize your processes, the idle capacity can either be used for growth, or it can be eliminated in the long term.Fair Costing is not guaranteed when using the Push Approach, because the costs of idle capacity are spread over products and customers that are not necessarily responsible for it. The only work around is to define dummy processes for carrying the costs of idle capacity. To do so, however, you have to know what these costs are, because without a quantity structure the system can’t determine them. In the Pull Approach, costs of idle capacity remain on the cost centers and can then be allocated to the plant or company level, where it makes sense. There are two different ABC scenarios supported by the R/3 system: Analytic ABC and Integrated ABC.Analytic ABC provides a statistical result, suitable for strategic cost views and high level what - if analysis. Integrated ABC results in actual cost postings throughout the CO application and cost objects, including CO-PA postings.Both methods of ABC are available when Integrated ABC is activated in R/3 customizing. Analytic ABC can also be used without activating Integrated ABC.In Integrated ABC, processes are full controlling objects (cost collectors) and are not statistical.Integrated ABC can be used for some overhead costs, while other indirect costs use the traditional surcharge method provided by costing sheets. The template is the new tool which traces process quantities to cost objects and to profitability segments (CO-PA). Multiple ABC delta versions may be used in analytic ABC. All delta versions are statistical.This allows the simulation of different process scenarios to co-exist while using the same cost center data. Operational ABC is conceptually valid in all industries as only the cost objects change.Process quantities can be traced to the corresponding industry specific cost objects.SAP offers also specific ABC solution integrated within the SAP Banking. 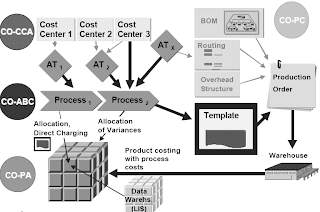 A process in R/3 is not "tied" to only one specific cost center rather being defined as a cross functional object with a unique cost driver.Indirect costs utilized by a process may be acquired from the responsible cost centers that they originate in.The process also can carry all different sorts of attributes such as value added/non-value added,which add a further dimension to managing the processes within an Activity Based Management framework. Business procedure within an enterprise that uses resources and can involve activities from a number of different cost centers in a controlling area.When executing a business process, activities can be utilized from several cost centers of a controlling area.All controlling objects require a company code.If business areas are used in the company code then the controlling object requires a business area.Cost centers and processes each have their own standard hierarchy.If profit center accounting is active, then a profit center must be assigned to each controlling object.The dummy profit center is used if an explicit assignment is not made. Process groups can be used to achieve different purposes.The standard hierarchy assignment is mandatory for all business processes.Alternative process groups are optional but very useful. They help to maximize the efficiency of process planning, organize the actual allocation function and provide for convenient user-defined reporting levels in the information system. Cost centers and processes both collect primary and secondary costs.Primary costs may be posted directly to cost centers.As of release 4.6, primary costs may be posted directly to processes.SKF’s (statistical key figures) may be posted to cost centers and processes.SKF’s may be used as tracing factors (allocation portions), in assessment, distribution, and indirect activity allocations. A cost center may perform many tasks. The amount of each task is measured by an activity type, e.g. man hours.A cost center must be linked to activity types in planning.Calculation of activity type prices requires “splitting”, which is the allocation of costs within a cost center to the various activity types to which it is linked. A business process is similar to a cost center with one output measure. Since there is only one process driver (output measure), the quantity measure and cost are automatically linked.Price calculation divides the process costs by the output quantity of this process. The process driver and activity type master data screens are identical.These choices apply to both plan and actual.If you will use template allocation of processes, use category 1.If you need to use different categories for actual and plan, check the “variant values for actual” box and enter the category for actual.If you need to use different price indicators for actual and plan, check the “variant values for actual” box and enter the price indicator for actual. A complete set of reports for process results as well as cost center and cost object reports are delivered with the system.Users can use both the report painter and report writer tools to supplement the delivered reports.In addition, the full functionality of the CO-PA reporting tool to write user reports will enable the process value fields to be included where desired. In Integrated ABC, processes become full controlling objects. They are integrated into the operational value flow of the R/3 system and can become relevant for inventory valuation.A structure called the process template is the central tool for assigning (or tracing) process quantities to cost objects. By selectively using Integrated ABC, you can allocate indirect costs to a single cost object using overheads (calculated with costing sheets), standard values, or processes for various types of overhead.In Profitability Analysis, you can also analyze process costs for a product on an aggregate level as these costs are transferred to CO-PA, through the cost component view of product costing.